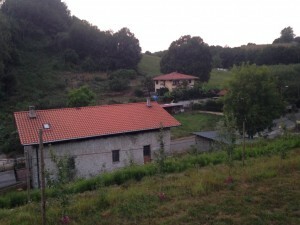 Yesterday we spent the majority of the evening at Petritegi Sagardoa. 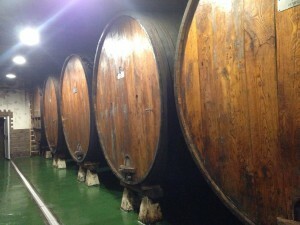 We began by touring the orchard and observing the steps of the cider-making process. I got to try impaling an apple with a kizkia, a tool that resembles a stick with a nail through the side of the bottom. The tool has no English translation. It is used to quickly pick apples up off the ground and deposit them into baskets. The apples are not picked directly off of the trees. After seeing the field, we moved inside to see the machinery. Some of the process is automated, but the first machine is labor-intensive, because it needs to be filled with apples manually. The coolest part, however, was the cellar. They have three different areas all with different temperatures. They are specific temperatures in the range of 8-14 degrees Celsius (approximately 46-57 degrees Fahrenheit). After touring the orchard, the cold air was refreshing. Now, for the cider. 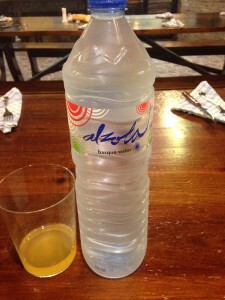 After watching a short film about the history of Basque cider houses, we got to try two different types. The first tasted sweeter and went down easier. The second was initially similar, although more bitter, but ultimately felt sharper going down. I, for one, appreciated the free water offered to us. Free is a relative term, as we paid sixty euros per person, I believe. The first course was extremely old-fashioned. Loaves of baguettes sitting on top of the long tables. I almost ate an entire one myself, but of course ended up sharing some of it. The rest of the meal consisted of three courses: cod, steak, and dessert. Of all the courses we had, my favorite was the steak. It could have been cooked a little longer, but that is the way it was intended to be served. The flavor, consistency, and even how it was cut, were all unusual. 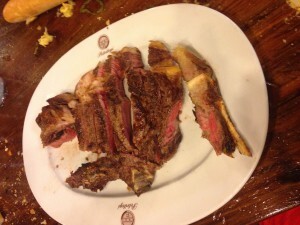 Compared to the steak, the rest of the food was just alright. I also enjoyed cracking open the walnuts for dessert. Although not important to me, I am sure many of my classmates appreciated our professors moving this farewell dinner to yesterday. With unlimited cider comes responsibility. All in all, everyone was fine. We even got shuttles right from the restaurant back to McDonald’s. It was definitely a good time. 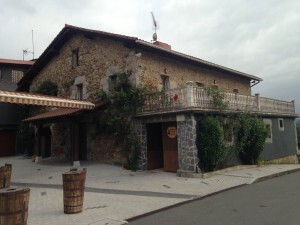 Though the cider house was fun, it was not the only good time we had in San Sebastian. 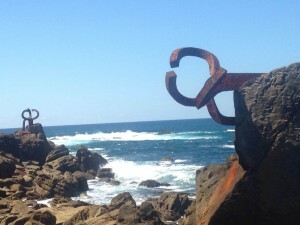 Above you can see the combs in the wind, a landscape beautified by Eduardo Chillida. It holds much symbolism. For me, it was interesting to hear that most of the air coming in from the coast enters through the combs. This is merely a fraction of the awe-inspiring scenic wonderland that is the coastal city of San Sebastian. The beaches here are magnificent, but I do wish the water was a bit warmer. Aside from all the late nights and fast paced life we underwent here, there was a calmer time. Our mornings were spent studying Spanish at Lacunza. We took two classes each day. The early class focused primarily on grammar, while the latter was dedicated to vocabulary and speaking. 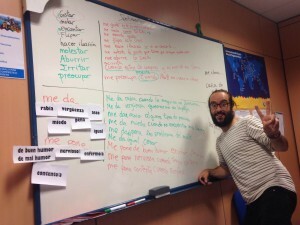 This is Fede, my second Lacunza professor. He always managed to bring high energy and stories to class. I learned a lot from him, to say the least. It takes some time to adapt to the culture here, but it is worth doing. The cuisine and culture here are very different from the melting pot of culture we have in the United States. I certainly missed a lot of Italian, Japanese, Mexican, and other countries dishes, but I learned to love a few foods here. This trip definitely expanded my cultural horizons. I still feel enlightened to know that Basque people do not typically drink Sangria, and that Spain has several distinct regions with very different cultures and traditions. Now I understand how different Basque and Spanish cultures are and why the Basques could not peacefully coexist in Spain while their cultural heritage was threatened by Franco.